HAMILTON — June Jones values consistency, and wants to demonstrate faith in his players. 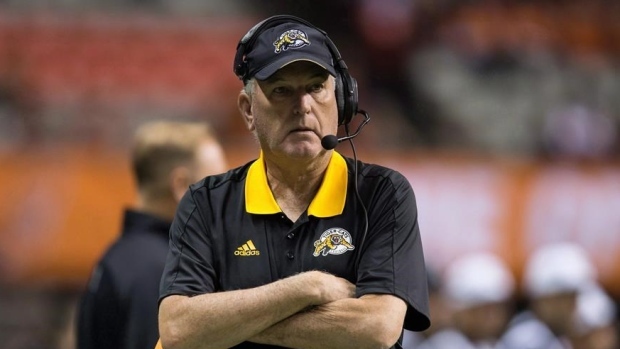 That's why one of his first tasks as Hamilton's full-time head coach will be to settle the Tiger-Cats' quarterbacking situation as quickly as possible. The Tiger-Cats dropped the interim tag on Jones's title on Monday as the two sides agreed to a three-year deal. Jones came on as a replacement head coach mid-season in 2017 and helped Hamilton go 6-4 after an 0-8 start. One of the keys to Jones's success after stepping in as head coach on Aug. 24 was installing Jeremiah Masoli as starting QB ahead of Zach Collaros, who had been under centre for Hamilton for most of its past four seasons. Masoli is a free agent but has said he would return to the Ticats if Jones was the head coach, while Collaros has one year remaining on his deal, reportedly one of the most lucrative in the CFL. "Obviously, we can't keep both of them," said Jones, who complimented the professionalism and playing ability of both quarterbacks. "We'll make that decision in the next few weeks and we're going to do what's best for everybody involved. That's a good problem to have." Complicating matters for the Tiger-Cats is that they have been in ongoing negotiations with Johnny Manziel, a Heisman Trophy-winning quarterback who played for the NFL's Cleveland Browns in 2014 and 2015 before being cut from the team for ongoing discipline and substance abuse issues. In January 2016, Manziel was charged after being accused of hitting and threatening a former girlfriend before reaching an agreement with prosecutors to dismiss the case. Because of those allegations, the CFL announced on Sept. 27 that it wouldn't approve a contract for Manziel until next season, and only if the 24-year-old quarterback met certain conditions stipulated by commissioner Randy Ambrosie. On Monday, Jones said that Hamilton general manager Kent Austin had been speaking with Manziel's agent and that the Ticats were waiting to hear back. He also said that, to the best of his knowledge, Ambrosie would approve the contract as long as some unnamed conditions were met. Fitting Manziel into Hamilton's wouldn't be a problem, according to Jones. "I can plug him in very, very easily," said Jones, noting Manziel's arm strength. "I really think that if he makes a commitment to come up here for three or four years that he'll write his own ticket if he wants to go down and play in the NFL again. It'll be a Warren Moon situation, to be quite honest. "I just think he has the potential to be a great player." Jones made a quick climb up the coaching ladder of the Tiger-Cats this summer. He joined the team as an assistant head coach on Aug. 2 before replacing Austin as head coach three weeks later. Under Jones, Hamilton's offence posted the CFL's most points for (295), net offence (4,071 yards), passing yards (3,081), rushing yards (1,149), offensive touchdowns (28), rushing touchdowns (13), first downs (226) and were second in points for per game (29.5), all while turning the ball over just a league-low 13 times. Defensively, Hamilton ranked first in rushing yards allowed per game (73.4), quarterback sacks (33), forced fumbles (13) and pass knock downs (38), and were second in interceptions (12) and net offence allowed per game (335.5 yards) over its last 10 games. "What June accomplished here as a head coach in the last half of the 2017 season was nothing short of remarkable," said Austin. "He is a strong leader with high character and extensive football knowledge, and we know he will be relentless in his efforts to put a winning product on the field in pursuit of a Grey Cup." Jones gave all the credit to Austin and the rest of the Ticats' front office for putting the pieces in place. In his view, he just got the team going in the right direction and not thinks Hamilton could be a Grey Cup contender as soon as 2018. "That's the No. 1 thing, I think we have the players in place, I think we have great kids," said Jones. "Kent has done a great job of accumulating character kids. There's no way you can win six games after going 0-8 if you don't have the right kind of kids in the organization."